Regulars: Thank you for stopping by but just as a heads up, this post is not VMware virtualization related. After a bit of hardware trouble from the local store, my replacement flight sim rig is up and running Lockheed Martin Prepar3D 4.3. I’m trying to shake the rust off after not having flown a leg for quite some time but everything sim and add-on related is looking good and I was able to fly KMSP-KLAX with many more FPS that I’ve been used to the past many years on FSX. Now, out of sheer coincidence late last week I received a promotion from MegaSceneryEarth. Normally I ignore these but since this was a 50% off deal and I’m essentially starting from ground zero with no scenery for Prepar3D, I took a look. After some chin scratching, I checked out with Minnesota, Arizona, Northern California, and Southern California. I felt like quite the opportunist until the email arrived with file download instructions. Each scenery is broken up into 2GB download chunks. Between the four sceneries, I was presented with 123 download links. With no FTP option that I’m aware of, I’m going to have to babysit this process. With each 2GB download taking anywhere from 5-10 minutes, this is going to feel a lot like installing Microsoft Office 2016 via floppy disk. Except longer. MegaSceneryEarth is available on shipped DVDs or USB sticks they cost a small fortune and of course the shipping and handling time. This is going to be painful. But… there’s a cheaper, faster, and fully automated way. PowerShell scripting. Now admittedly for my first scenery, I threw the v1.0 PowerShell script version together quickly using the Invoke-WebRequest cmdlet with my own static scenery-specific lines of code to serve my own needs. And it worked. I launched the script, walked away for a few hours, and when I came back I had a directory full of MegaSceneryEarth .zip files ready for installation. It worked beautifully and it didn’t consume bunches of my time. I still had three sceneries left to download. While I could have made new static scripts for the remaining three sceneries, my mind was already going down the road that this script would be more powerful if one script worked on a variety of MegaSceneryEarth downloads. It becomes flexible to use for my future MegaSceneryEarth sceneries as well as extensible if shared with the community. The starting point or first file to download. Usually this will be 1 but if for some reason a previous download was stopped or interrupted at say 6, we’d want to continue from there assuming we don’t want to re-download the first 5 files all over again. It figures out what the base path and file name URL is for the scenery. For any given scenery, these parts never change across all of the download links within a scenery but they will change across sceneries. It figures out how many .zip files there are to download in total for the entire scenery. 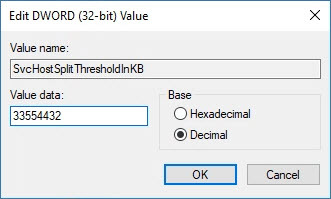 Because MegaSceneryEarth likes to use leading zeroes as part of their naming convention, and leading zero strings aren’t the same thing as leading zero integers in terms of PowerShell constructs, it figures out how to deal with those for file names and looping iterations. Basically when you go from “009” files in a scenery download to “010”, without dealing with that, stuff breaks. I think most MegaSceneryEarth sceneries have more than 9 files, but some have less (Deleware has 1). The script deals with both kinds. That I know of, MegaSceneryEarth doesn’t have a scenery with more than 99 .zip files but version 2.1 of the script will accommodate that. It figures out the correct file name to save on the local hard drive for each scenery file downloaded. This may sound stupid but that I know of, the Invoke-WebRequest cmdlet requires the output file name and doesn’t automatically assume the file name should be the same as the file name being downloaded via HTTP such as a copy command to a folder would. Generally speaking, for automation to work properly, it relies on input consistency so that all assumptions it makes are 100% correct. Translated, this script relies on consistent file/path naming conventions used by MegaSceneryEarth. Not only within sceneries, but across sceneries as well. And so here it is. Copy the PowerShell script below and execute in your favorite PowerShell environment. Most of the time I simply use Windows PowerShell ISE. The code isn’t signed so you may need to temporarily relax your PowerShell ExecutionPolicy to Bypass . It’s there to protect you by default. # Internet Explorer: Right click the download link and choose "Copy shortcut"
# Google Chrome: Right click the download link and choose "Copy link address"
$firstfile1 = "paste first file download link here.zip"
# Provide the path on your hard drive where the files will temporarily be saved. $httppath = $firstfile3 + "/"
$firstfile5 = $firstfile4 -split "001_of_"
$firstfile7 = $firstfile5 -split ".zip"
Last week I was made aware of an issue a customer in the field was having with a data protection strategy using array-based snapshots which were in turn leveraging VMware vSphere snapshots with VSS quiesce of Windows VMs. The problem began after installing VMware Tools version 10.0.0 build-3000743 (reported as version 10240 in the vSphere Web Client) which I believe is the version shipped in ESXI 6.0 Update 1b (reported as version 6.0.0, build 3380124 in the vSphere Web Client). The issue is that creating a VMware virtual machine snapshot with VSS integration fails. The virtual machine disk configuration is simply two .vmdks on a VMFS-5 datastore but I doubt the symptoms are limited only to that configuration. 2016-07-29T19:26:47.407Z| vmx| I120: DISKLIB-LIB_CREATE : DiskLibCreateCreateParam: vmfsSparse grain size is set to 1 for ‘/vmfs/volumes/51af837d-784bc8bc-0f43-e0db550a0c26/rmvm02/rmvm02-000001. 2016-07-29T19:26:47.408Z| vmx| I120: SNAPSHOT: SnapshotPrepareTakeDoneCB: Prepare phase complete (The operation completed successfully). 2016-07-29T19:26:56.292Z| vmx| I120: GuestRpcSendTimedOut: message to toolbox timed out. 2016-07-29T19:27:07.790Z| vcpu-0| I120: Tools: Tools heartbeat timeout. 2016-07-29T19:27:11.294Z| vmx| I120: GuestRpcSendTimedOut: message to toolbox timed out. 2016-07-29T19:27:17.417Z| vmx| I120: GuestRpcSendTimedOut: message to toolbox timed out. 2016-07-29T19:27:17.417Z| vmx| I120: [msg.snapshot.quiesce.rpc_timeout] A timeout occurred while communicating with VMware Tools in the virtual machine. 2016-07-29T19:27:17.420Z| vmx| I120: SnapshotVMXTakeSnapshotComplete: Snapshot 0 failed: Failed to quiesce the virtual machine (31). 2016-07-29T19:27:17.420Z| vmx| I120: VigorTransport_ServerSendResponse opID=ffd663ae-5b7b-49f5-9f1c-f2135ced62c0-95-ngc-ea-d6-adfa seq=12848: Completed Snapshot request. 2016-07-29T19:27:26.297Z| vmx| I120: GuestRpcSendTimedOut: message to toolbox timed out. After performing some digging, I found VMware had released VMware Tools version 10.0.9 on June 6, 2016. The release notes identify the root cause has been identified and resolved. After downloading and upgrading VMware Tools version 10.0.9 build-3917699 (reported as version 10249 in the vSphere Web Client), the customer’s problem was resolved. Since the faulty version of VMware Tools was embedded in the customer’s templates used to deploy virtual machines throughout the datacenter, there were a number of VMs needing their VMware Tools upgraded, as well as the templates themselves. 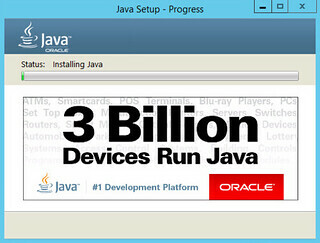 3 Billion Devices Run Java. Unfortunately (or fortunately depending on how you look at it) my workstation isn’t one of them. I’m no stranger to Java and I’m more than willing to share my bitter experiences with it but rarely does my dissatisfaction stem from the installation process itself (that is if you don’t count the update frequency). This blog post is for my future self as I’m bound to run into it again. I encountered a never before seen by me problem installing the Windows Offline (64-bit) version of Java Version 8 Update 73 on Windows 7. The usual tricks did not work. Uninstalling the old version first. Run as administrator. Directory and registry scrubbing. System reboot. Trying an older version. 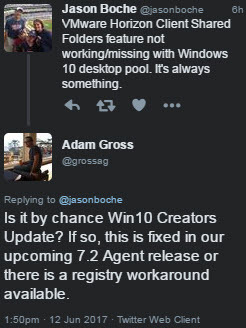 In fact all version 8 builds exhibited this behavior. It wasn’t until I rolled all the way back to a version 7 build that the installation was successful. For posterity, this spiceworks thread covers a lot of ground; there seems to be a variety of fixes for an equal number of root causes which all yield the same Java installation failure. 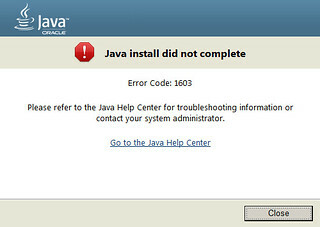 The Java knowledgebase covering this issue offers some basic workarounds under Option 1 such as a system reboot, offline installer, uninstalling old versions, all of which I had already tried without success. 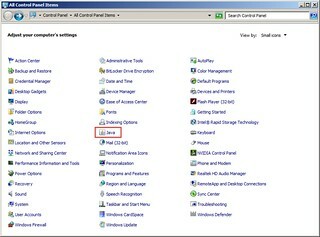 The fix in my particular instance was Option 2: Disable Java content (in the web browser) through the Java Control Panel. You’ll find the Java applet in the Windows Control Panel when a 32-bit version of Java is installed. 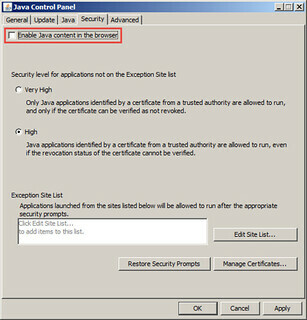 On the Security tab, temporarily deselect the “Enable Java content in the browser” checkbox. Complete the 64-bit version of Java installation (launch the installer using “Run as Administrator“) and don’t forget to “Enable Java content in the browser” when finished. Update 5-12-16: If you’re receiving this error and “Enable Java content in the browser” is already deselected, check the box, Apply, OK, uncheck the box, Apply, OK. I ran into a small problem this week in vCloud Director whereby I was unable to Delete a Network Pool. The error message stated Cannot delete network pool because It is still in use. It went on to list In use items along with a moref identifier. This was not right because I had verified there were no vApps tied to the Network Pool. Furthermore the item listed still in use was a dynamically created dvportgroup which also no longer existed on the vNetwork Distributed Switch in vCenter. 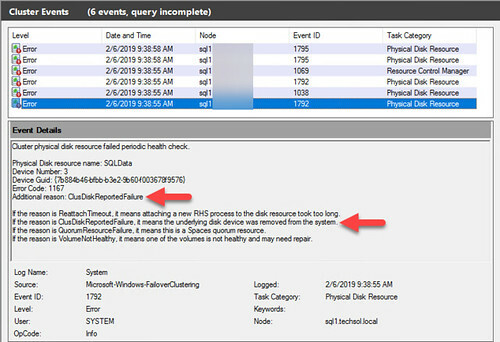 I suspect this situation came about due to running out of available storage space earlier in the week on the Microsoft SQL Server where the vCloud database is hosted. I was performing Network Pool work precisely when that incident occurred and I recall an error message at the time in vCloud Director regarding tempdb. I tried removing state data from QRTZ tables which I blogged about here a few years ago and has worked for specific instances in the past but unfortunately that was no help here. Searching the VMware Communities turned up sparse conversations about roughly the same problem occurring with Org vDC Networks. In those situations, manually editing the vCloud Director database was required. An obligatory warning on vCloud database editing. Do as I say, not as I do. 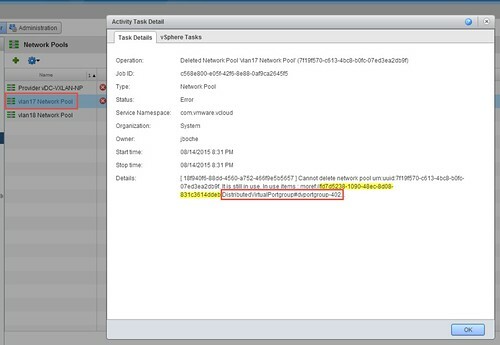 Editing the vCloud database should be performed only with the guidance of VMware support. Above all, create a point in time backup of the vCloud database with all vCloud Director cell servers stopped (service vmware-vcd stop). There are a variety of methods in which you can perform this database backup. Use the method that is most familiar to and works for you. Opening up Microsoft SQL Server Management Studio, there are rows in two different tables which I need to delete to fix this. This has to be done in the correct order or else a REFERENCE constraint conflict occurs in Microsoft SQL Server Management Studio and the statement will be terminated. That should take care of it. Start the vCloud Director service in all cell servers (service vmware-vcd start) and verify the Network Pool has been removed.